There's a wonderful mix of people attending the Royal Wedding between Prince William and Kate Middleton many we won't know as they are just everyday people but of course there's many we do know in terms of the Royal Family, Dignitaries and Celebrities. The following are all confirmed to attend the Royal Wedding Service at Westminster Abbey on the 23rd April 2011. Amongst the guests at The Wedding Service are all Heads of Mission in London representing countries with which the United Kingdom has normal diplomatic relations and Her Majesty's Lord Lieutenants for the United Kingdom. These individuals will not be accompanied by their spouses or partners. Major Archer Burton was Prince William and Prince Harry's Commanding Officer in the Household Cavalry. He also led the Burnaby Blue expedition to southern Africa – an African community project supported by Sentebale, in which Prince Harry was involved. Charlie Mayhew is Chief Executive of the Conservation Charity, Tusk Trust. Prince William and Prince Harry visited Tusk-funded projects in Botswana last year. The visit to Africa was the first overseas Royal tour that Prince William and Prince Harry undertook together. Alison Moore Gwyn is Chief Executive of Fields in Trust. In 2010, Prince William became Patron of The Queen Elizabeth II Fields, an initiative to protect and create hundreds of playing fields throughout the UK in honour of The Queen's Diamond Jubilee. The project is run by Fields in Trust. Seyi Obakin is Chief Executive of Centrepoint. Centrepoint became Prince William's first Patronage in 2005. His mother, Diana, Princess of Wales was also Patron of the Charity. Seyi slept rough with Prince William in London to highlight the issue of homelessness. Peter Cross is Chief Executive of the charity SkillForce, of which Prince William has been Patron since 2009. Earlier this month, Prince William officially launched the SkillForce Prince's Award, in recognition of the contribution that young people make to their communities. Simon Johnson worked closely with Prince William as Chief Operating Officer of the FA's 2018 World Cup bid. Sir Trevor is the Football Association's Director of Football Development and is responsible for youth-coaching standards in England. Prince William has been President of the FA since 2006 and has met Sir Trevor on several occasions at FA events. Australian Prince William met the Olympic swimmer, Ian Thorpe, on a visit to Australia in 2010. The Prince has since supported Mr. Thorpe's charitable organisation Ian Thorpe's Fountain for Youth, which focuses on improving health and education for children. Brigadier Smyth-Osbourne was Prince William and Prince Harry's Commanding Officer in the Household Regiment and acted as their military mentor. He was also Prince Harry's Commanding Officer when The Prince undertook active service in Afghanistan. Major Bartle-Jones was Prince William's Squadron Leader in the Household Cavalry Regiment based at Windsor. Wg Cdr Steve Bentley is Prince William's Search and Rescue Force Squadron Leader at RAF Valley, Anglesey. Sgt Keith Best is a colleague of Prince William's at RAF Valley, in Anglesey, North Wales. The Winchman was awarded the Queen's Commendation for Bravery in the Air after playing a major role in the rescue efforts in the Cumbrian floods in 2009. Sqn Ldr Paul Bolton is a colleague of Prince William's at RAF Valley in Anglesey, North Wales. Holly is sister to 2nd Lieutenant Joanna Dyer, who was killed by a bomb in Iraq in 2007. Joanna was a close friend of Prince William's at Sandhurst. In a statement released by Clarence House at the time, Prince William said he was "deeply saddened to hear the tragic news and he is very much thinking of her family and friends right now and they will remain in his thoughts and prayers." Susie Roberts is the widow of Major Alexis Roberts, who was killed in Afghanistan in 2007. Major Alexis Roberts was Prince William's Platoon Commander at Sandhurst. In a statement released at the time, Prince William said he was deeply saddened to learn of Major Robert's Death. The Prince remembers him with 'great fondness and respect'. Former soldier Bryn Parry and his wife Emma founded the charity Help for Heroes to assist wounded service men and women. Both Prince William and Prince Harry are supporters of the charity and Prince William previously opened a new swimming pool at Headley Court in 2010, which had been funded by Help for Heroes. Mr. Edward Gould was Master of Marlborough College whilst Miss Middleton was a student. Dr Andrew Gailey is the Vice-Provost of Eton College and was Prince William's Housemaster. Australian Ed Dawson-Damer is an ex-Irish Guards officer, who was Equerry to Queen Elizabeth The Queen Mother in the 1980's. He hosted Prince William for a section of his visit to Australia in January 2010. New Zealander Sam Stevenson was Prince William's New Zealand equerry during his visit to the country in July 2005. At the time, Sam was a Captain within the New Zealand Defence Forces. During the visit, Prince William undertook official engagements representing The Queen in Wellington and Auckland at events to commemorate the end of the Second World War. Prince William, as President of the Football Association, has met footballer David Beckham on a number of occasions. They recently worked together as Ambassadors of England's 2018 World Cup Bid. 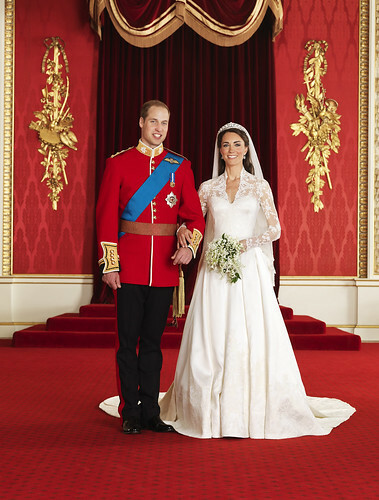 Photographer Mario Testino took Prince William and Miss Middleton's official portrait photographs to mark their engagement. Tara Palmer Tomkinson is a friend of The Prince of Wales and his family. Amateur jockey Sam Waley Cohen is a friend of Prince William and Miss Middleton.